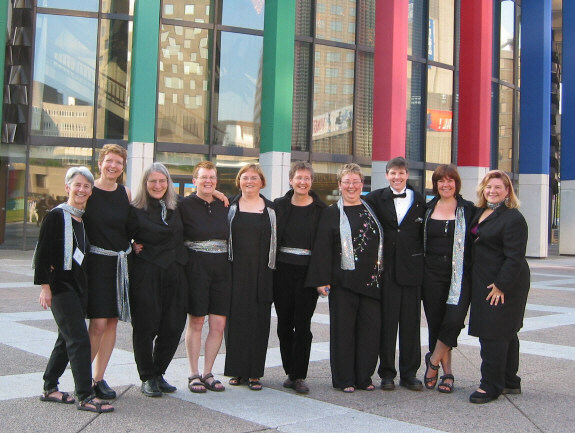 The Women Next Door is a small lesbian-feminist a cappella choir based in Halifax, founded in 1992. We use song a tool for social change. We sing about women's empowerment, lesbian visibility, queer rights, peace, love, racism, etc. We believe song and harmony can deliver a powerful message. Anything about social justice that moves us, bascially. We gather our songs from friends, other choirs, local song writers, some of whom are within our own group. Our set for the upcoming Unison Festival (see link below) features entirely Nova Scotian artists, two from our own group. We are a small affinity group with usually no more than 12 members. You can see the Women Next Door at events like TakeBackTheNight, Dec. 6th Memorials, Pride Marches, Women's Festivals, etc. We are also part of a dynamic and international movement of LGBT choirs that have regular festivals. At this point we are preparing to go to the Canadian Unison Festival in Vancouver in May 2006 (http://www.unison2006.com/). We are also well-known for hosting regular She-Bop Dances in Halifax as virtually our only fundraising tool. These provide a fun and safe space for women of all-ages to dance to music of all-ages. The response we get from the people who watch us perform is more than enough to keep us going. The festivals we attend are non-competitive and we consider an invitation to sing as an affirmation of what we do. If people want to find out about an upcoming performance, we advertise these in WayvesMagazine or you can contact KimVance at 442-3630.